An ad for L’Wren Scott’s collection at Banana Republic. I’m very excited about designer L’Wren Scott’s upcoming collection at Banana Republic. I have become more interested in her aesthetic over the past year after reading a few articles and interviews with her that trace her career path. She was a model before becoming a celebrity stylist and she started her own line in 2006. My mother and I checked out her clothes at Barney’s once and were impressed with the attention to detail and the classic and ladylike feel to the collection. It also seems L’Wren never met a sequin (or lace) she didn’t like and I can definitely relate to that! L’Wren is the beautiful brunette. She is 6’3! L’Wren’s regular line is quite expensive—have a look here to see what I mean—so I’m happy she’s doing a collaboration with Banana Republic so I can add some of her designs to my closet without breaking the bank. A write-up about the Banana Republic collection in the November 2013 issue of Vogue. 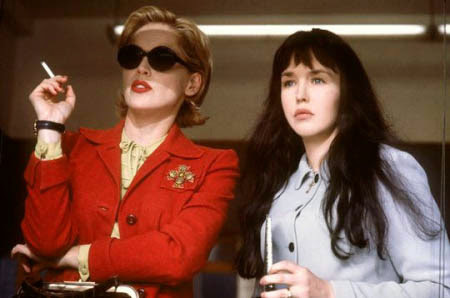 Sharon Stone and Isabelle Adjani in Diabolique, 1996. Did you know L’Wren was one of the costume designers in the remake of Diabolique with Sharon Stone and Isabelle Adjani? I loved Sharon Stone’s feminine yet structured yet va-va-voom look in the movie. It had a vintage vibe to it and this was back in 1996 when vintage was not as popular as it is today. The sequined cardigan and red clutch will find a home with me! There is a lot of red in L’Wren’s collection for Banana Republic and I can definitely see one of the sequined sweaters and the lips clutch finding their way into my closet. The collection is available in stores and online on December 5. Let this be your friendly reminder that Adrienne and I would love for you to join us for “How I Wear My: Red”. We are accepting photos until December 3, 2013. As for the lovely L’Wren, an interview with her that I liked is at The Telegraph. There is also a fun read about her beauty routine over at Into the Gloss. If you want to see the amazing Paris apartment she shares with boyfriend Mick Jagger, you can check it out here. UPDATE: Due to a timing conflict Adrienne and I have to reschedule “How I Wear My: Red” so we will now accept pictures until December 8, 2013. Geez, those are some prices!!!! I checked that Netaporter link you gave and I must say I'd have to break A LOT of (my piggy) bank(s). :D But her designs really are gorgeous and her work meticulous. And she is gorgeous too, no wonder she started out as a model! I can hardly wait to get my paws on some of that L'Wren Scott fabulousness. She is one of my tall women idols...is one of the few people I know of who is taller than me! Wow I love the look of this. My husband will not be at all pleased that you shared this with me! LOL The retro aesthetic is very much me. Mr. Jaggar doesn't seem at all to mind that he is a full foot shorter than his date! He likes 'em tall and leggy. I saw that page in Vogue and ripped it out cuz the outfit was SO beautiful! We'll see. Hi Denton! I thought the article and the ad about L'Wren's collection both looked great. I can't wait to see this collection in person. FYI, I saw that the flagship store of BR is in Rockefeller Center and they are having a 20% off pre-sale on L'Wren's collection on December 3. I may go to this event! hah, I may see you there!